If you are going to be in or near Kansas City, MO on May 5th and have a chihuahua register and participate in the Chihuahua Parade. Cinco de Mayo will never be the same in Kansas City. The Guinness Book of World Records has sanctioned the Chihuahua Pet Parade and Festival to attempt to break the record for the most dogs in costume. Dress up your chihuahua, chihuahua mix, or wannabe chihuahua and walk in the parade. If your dog loves a parade and isn’t a chihuahua, she’s welcome to march too! 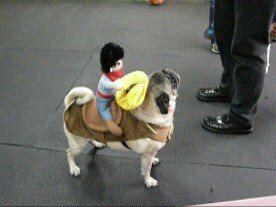 All that is required is that your dog be a dog (there will be someone there to verify this) and be in a costume. If you have a Great Dane who thinks she’s a chihuahua, then bring her down for the parade. All dogs must be on leash and in costumes, tolerant of other dogs, and ok with crowds. The parade has attracted many news sites and it is expected to have a huge crowd of spectators watching on May 5. If your dog gets nervous in crowds and doesn’t like parades, it is best to leave her home and just bring yourself and a camera. This parade promises to be awesome. The goal is to have 700 dogs in costume on May 5 and to participate the fee is $5. Arrive by 10:30am to register and pick your spot in the parade at Broadway and Southwest Boulevard, KCMO. When you check in you’ll receive a gift bag for participating and there will be a group photo of the marchers taken at 11am. The block-long parade will raise money for Pet Connection, a no-kill rescue group. The current record for a dog parade is 603 dogs in costume set in Tokyo in May 2011. Help set a new record and register on the Pet Connection website. This event was a great group of folks that turned out and were disappointed by the total lack of preparation and organization. The location was an asphalt parking lot on a very hot day. No shade, no seats, no place for the dogs to relieve themselves, the heat was in the high eighties and several people left early. Yes, there was a pig that annoyed everyone. Another person was hawking “Beverly Hills Chihuahua 3″; don’t we remember how many Chihuahuas ended up in shelters because of that movie? No one seemed to be in charge and we stood around for hours in the heat waiting for something to happen. Finally I saw a guy walking around with a clicker…”you got any dogs back there?”…”yep, we got three”…”OK” click, click, click. I can’t see any way that this would have lived up to Guinness standards. I even bet the pig was counted. The “Parade” was four hundred people and their dogs trying to shuffle down a sidewalk, in front of businesses that were open, with customers coming and going and cars driving by, parking and leaving. Total fail. Valentine, please don’t “organize” anything else. You don’t know what you are doing.